We want to make life a little easier for your book club. We have prepared Book Club Kits: bags that contain 8 to 10 copies of the same book, possibly enough for all the members of your book club. Each kit also contains a laminated card of discussion questions to get you started. Book Club Kits are available on the bottom shelf of the New Fiction section. One person checks out the kit and distributes the books to other members of the book club. Kits can be checked out for 4 weeks with one renewal. To request a kit, please call the Reference Desk at (508)261-7380 x3. Book Club Kits cannot be requested online. Book Club Kits should be returned to the circulation desk at the Mansfield Public Library. They may not be returned to other libraries or placed in the book drop. What titles do you have? 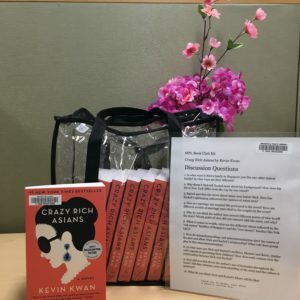 Search the catalog by searching for “Book Club Kit” and limit your search to the Mansfield Public Library; you will see which kits are currently available. Lists of Book Club Kit titles also are included in each kit. We hope to add more kits if you like this program. What happens if you lose a book? Or return it late? The overdue fines for a book club kit are $.50 per day, with a maximum of $5. If your group happens to lose a book you will be charged for the price of the book.